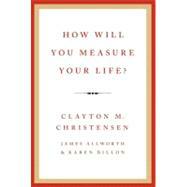 From the world's leading thinker on innovation and New York Times bestselling author of The Innovator's Dilemma, Clayton M. Christensen, comes an unconventional book of inspiration and wisdom for achieving a fulfilling life. Christensen's The Innovator's Dilemma, notably the only business book that Apple's Steve Jobs said "deeply influenced" him, is widely recognized as one of the most significant business books ever published. Now, in the tradition of Randy Pausch's The Last Lecture and Anna Quindlen's A Short Guide to a Happy Life, Christensen's How Will You Measure Your Life is with a book of lucid observations and penetrating insights designed to help any reader-student or teacher, mid-career professional or retiree, parent or child-forge their own paths to fulfillment.